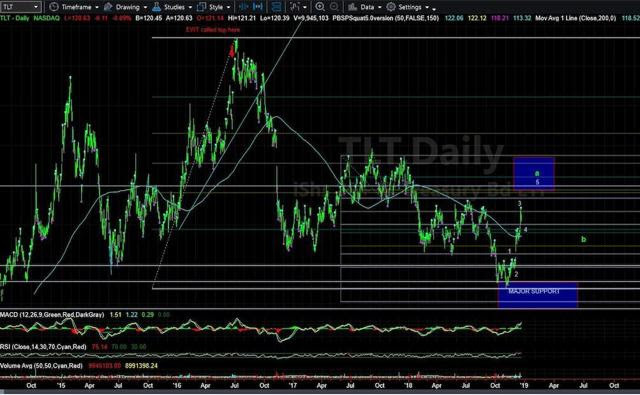 And, in less than two months after striking the bottom, TLT was already approaching my first target of 124, after which I expected a b-wave pullback. And, these are just a sample of the posts to my recent bond articles. Clearly, you can see that there was a sizeable segment of the market which disagreed with my perspective. It seems that these posts represented the general negative sentiment of the bond market overall. Moreover, when the market is generally this negative, it quite commonly moves in the opposite direction. Now, consider that these comments were made even AFTER TLT had completed its initial rally from the 113 region to my first target of 124. In other words, we still have many bears left in the market despite an almost 10% rally in bonds. You see, the market was quite entrenched in the downtrend into the November lows, and just like most market participants always do, they expected the immediate trend to continue unabated. But, what is more surprising is that many remained entrenched in that prior decline even after a 10% rally off the lows. And, in case you did not recognize some of the comments above, almost half the comments are from “professionals” in the industry. But, as I have noted before, even professionals are not immune from being swayed by the pervasive negative sentiment of the market near the bottom. In other words, professionals are just as influenced by herding as are all market participants. Experts’ earnings predictions exhibit positive bias and disappointing accuracy. These shortcomings are usually attributed to some combination of incomplete knowledge, incompetence, and/or misrepresentation. Mr. Olson’s article suggests that “the human desire for consensus leads to herding behavior among earnings forecasters,” with the herd always looking for the current trend to continue unabated and indefinitely. Sound familiar? Lastly, when I published my expectation for another rally in TLT in early March, many attempted to relate that expectation to a decline in the stock market. So, recently, I penned an article on FATrader.com explaining why this is a wrong perspective to take, and you can read that here. In the coming days, TLT will approach its next test. If it will be unable to move through the 127.25 level, then we will likely see a pullback lasting for at least a week before we head up to the 128 region. However, if we see a move in the coming week through the 127.25 level, and we are able to continue strongly through 128, then we will be targeting the 130/131 region next. In other words, the market will likely decide shortly if it will be providing us with larger degree extensions or not. But, as long as all pullbacks hold over 124, I still see a rally to at least the 128 before I even consider it to potentially be topping. Avi Gilburt is a widely followed Elliott Wave analyst and founder of ElliottWaveTrader.net, a live trading room featuring his analysis on the S&P 500, precious metals, oil & USD, plus a team of analysts covering a range of other markets. He recently founded FATRADER.com, a live forum featuring some of the top fundamental analysts online today to showcase research and elevate discussion for traders & investors interested in fundamental rather than technical analysis.